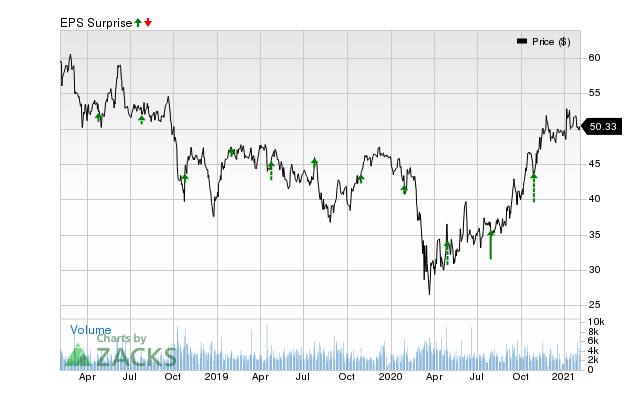 If you are looking for a stock that has a solid history of beating earnings estimates and is in a good position to maintain the trend in its next quarterly report, you should consider International Paper (IP). This company, which is in the Zacks Paper and Related Products industry, shows potential for another earnings beat. This global paper and packaging company has seen a nice streak of beating earnings estimates, especially when looking at the previous two reports. The average surprise for the last two quarters was 7.40%. For the most recent quarter, International Paper was expected to post earnings of $1.09 per share, but it reported $1.19 per share instead, representing a surprise of 9.17%. For the previous quarter, the consensus estimate was $0.89 per share, while it actually produced $0.94 per share, a surprise of 5.62%. With this earnings history in mind, recent estimates have been moving higher for International Paper. In fact, the Zacks Earnings ESP (Expected Surprise Prediction) for the company is positive, which is a great sign of an earnings beat, especially when you combine this metric with its nice Zacks Rank. International Paper currently has an Earnings ESP of +0.39%, which suggests that analysts have recently become bullish on the company’s earnings prospects. This positive Earnings ESP when combined with the stock’s Zacks Rank #3 (Hold) indicates that another beat is possibly around the corner. We expect the company’s next earnings report to be released on October 24, 2018.